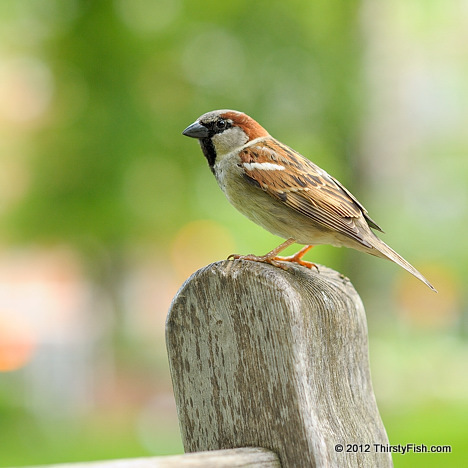 The House Sparrow is a sparrow native to Europe, The Mediterranean and much of Asia. It has been introduced to the rest of the world, and is widespread in South Africa, Australia and the Americas. This chunky bird lives intimately with humans, and can be found in most places where there are houses or buildings. In many parts of the world it is considered a pest, and a threat to the native bird species. In China, between the years of 1958 and 1962, there was a campaign to eliminate Four Pests; namely rats, flies, mosquitoes, and sparrows. The campaign, also know as the "Kill a Sparrow Campaign", did not work out too well for the Chinese. The extermination of sparrows upset the ecological balance, and enabled crop-eating insects to proliferate. Drought, weather, together with bad government policies such as killing of sparrows and misuse of pesticides, contributed to the Great Chinese Famine. Scholars have estimated that the famine claimed somewhere between 20 and 43 million victims. If the killing of just one species can lead to, or contribute to, millions of human deaths, consider the unanticipated consequences of all the other ways we are impacting nature. We have to err on the side of caution. Nature is so much stronger than us humans. These days, in certain political circles, it has become fashionable to bash global warming. What if climate scientists are right? What if we are changing the climate in an irreversible way that jeopardizes our future? Is it really worth it to gamble with the future of humanity, just to win a few political points?